Join South Africa’s Bike Friendly Business & Tourism Network. Boost your exposure to cyclists and the cycle tourism market. 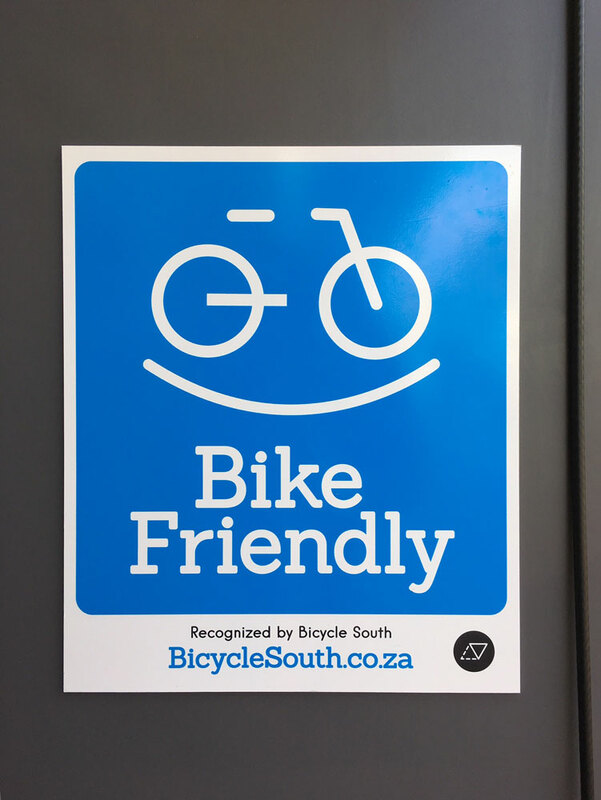 South Africa’s first-ever Bike Friendly Certification programme recognises & promotes businesses that cater for & welcome cyclists & cycle tourists. The programme also assists businesses to become more bike friendly, while enhancing the South African bicycling experience. – Restaurants, Cafes, Wineries, Breweries, Food shops etc. – Accommodation providers e.g. lodging or camping. – Bike Shops, Apparel & Gear, Bike Rentals, Cycle Tours & Holidays. – Workplaces, Retailers/Shops, Attractions, Visitor Centres or Tourism related businesses. – Bike Parks, Mountain Bike Trails, Events & Skills Training. Boost your exposure to SA’s thriving cycle tourism market & the local cycling community. Cycling is one of the fastest growing sports and recreational activities in the country, with events like the Cape Town Cycle Tour bringing in +- R450 million to the region. The South Africa is not only home to a multitude of mountain biking and road cycling events, but is also some exciting adventure cycling routes like the Western Cape’s Cross Cape and Overberg Meander. These events and routes attract both international and South African tourists. By joining the programme, your business will be primed to tap into this growing segment of the economy. Build customer loyalty & attract new cycling customers. Being bike friendly is good for business – it supports more people to bike local – shop local – creating healthy, happier more active communities where local businesses thrive. Get featured on SA’s leading cycle tourism platform. Grow brand awareness & engagement. Our mobile-friendly, location-based directory is the go-to resource for cycle tourism in South Africa – showcasing a network of top bike friendly destinations & businesses. Through our website and social media channels we engage an active, dedicated audience – reaching between 2 000 – 10 000 people per week. Access Membership Benefits (see below for the full range of benefits) and the official Bike Friendly Certified Signage (window decals or sign boards). Empower change. Your support fuels our projects to improve facilities for cyclists and empower more people to ride! This year we have teamed up with some awesome companies to bring you a host of membership benefits – from discounts on bike racks and products for your business to deals on bikes, gear and more… Plus all our members receive a free Bike Friendly Sign and toolkit. 10% off OmniBlend products and blenders! 10-20% off Bikes & Gear from Everyday Cycle Supply Co. Discounts on cycle safety & learn2cycle workshops. Register your business as Bicycle Friendly by filling out our online sign up form *, or contact us for assistance or for a digital brochure. Before you sign up have a quick browse through our Go Bike Friendly guide to identify the kinds of bike friendly services & amenities that you may want to offer to attract and support visiting cyclists and become a certified Bike Friendly Business! For example, you may want to provide a bike storage space for overnight visitors or a safe place or bike rack for customers to park their bikes. Want to go bike friendly but don’t know where to start? Get in touch, we are happy to assist you with going bike friendly, sourcing bike racks and meeting certification requirements! Here we highlight some of shining members of our Bike Friendly Network – those business who have gone the extra mile to welcome and cater for the needs of cyclists.